Successfully Added HK Warehouse Blackview BV9000 Phone - IP68, Android 7.0, 4GB RAM, 64GB Memory, 5.7 Inch Screen, 4G LTE, 13MP (Gold) to your Shopping Cart. Octa-core processor, 2.6 GHz speed, and 4 GB Ram for the most reliable results. Up to 27 hours of continuous talk time due to its long-lasting battery. IP68 Rating makes it a master of the outdoors able to go anywhere you go. 5.7-inch large screen with clear graphics. Smartphones have become a basic necessity for every individual in the modern world. This is due to the fact that the latest smartphones serve a whole lot of purposes other than their communication. They have replaced digital cameras and mp3 players and are now our personal assistance, however not all phone were made equal, some were susceptible to harsh weather, dirt, the wet and drops, Not this one. 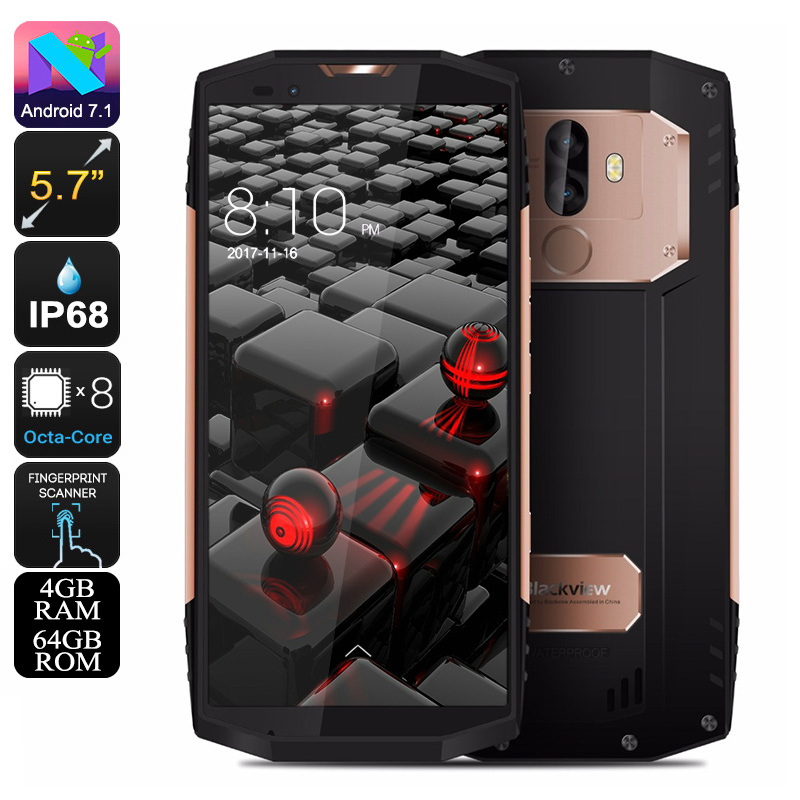 With its IP68 rugged rating and high-tech features, the Blackview BV9000 rugged phone is sure to be an immensely popular. This smartphone takes data privacy and security to a whole new level as it boasts a fingerprint sensor. If you have set the fingerprint screen lock, no other person, apart from you, will be able to unlock your phone and access the data. Furthermore, it has an IP68 waterproof and dustproof rating. Thus, there is no risk of the phone being damaged by water even if you are taking it to a pool party or your trip to the beach. You can click as many photos as you can and make as many videos as you want with this phone during your trip to the beach or while swimming and share them on your social media profiles with your friends. Another feature that sets this smartphone apart from the other models that are available in the market is its large screen with amazing graphics. Due to its 5.7inch screen, users can play games and watch their favorite shows/movies for hours comfortably, and with this corning gorilla glass 3 protection its resistant to scratches and well protected from drops. If you are fond of photography this smartphone, with its dual (13 + 5) megapixel rear camera, will be a real treat. It promises exceptional results. For selfie lovers, this smartphone is a treat because of its high quality 8MP front camera. Its 64GB internal memory provides ample space for you to keep plenty of images and home movies. The Blackview BV9000 promises exceptional battery timings and talk time due to its powerful 4180mAh battery. It is non-removable. It will take about 2.5 hours to charge. Once it is fully charged, it will offer about 27 hours of continuous talk time and 28 days battery standby. The Blackview BV9000 rugged phone comes with a 12 months warranty. Brought to you by the leader in electronic devices as well as wholesale waterproof smartphones and Android devices..